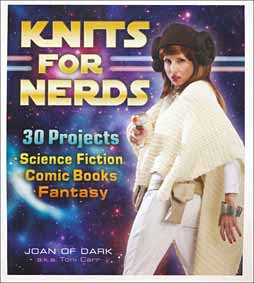 Batty Knits: Knits for Nerds! Now, I would be excited just that she has a new book out, and that she's awesome (because, among other things, she likes bats). However, just to make things more amazing, I have TWO patterns in the book - Jayne Cobb Socks and Tank Girl Socks. I'm really happy with how they turned out, and the photos are simply amazing! Now here's the bad news. You want to buy it right now and knit all the things? Sorry. Not gonna happen. You have to wait until February 21, 2012. However, you CAN pre-order it from various online booksellers. Somehow, seeing the book up on Knit Picks today really made my day. I love Knit Picks. They provided all the yarn support for my sock patterns in the book. In fact, go pre-order the book there! I insist.